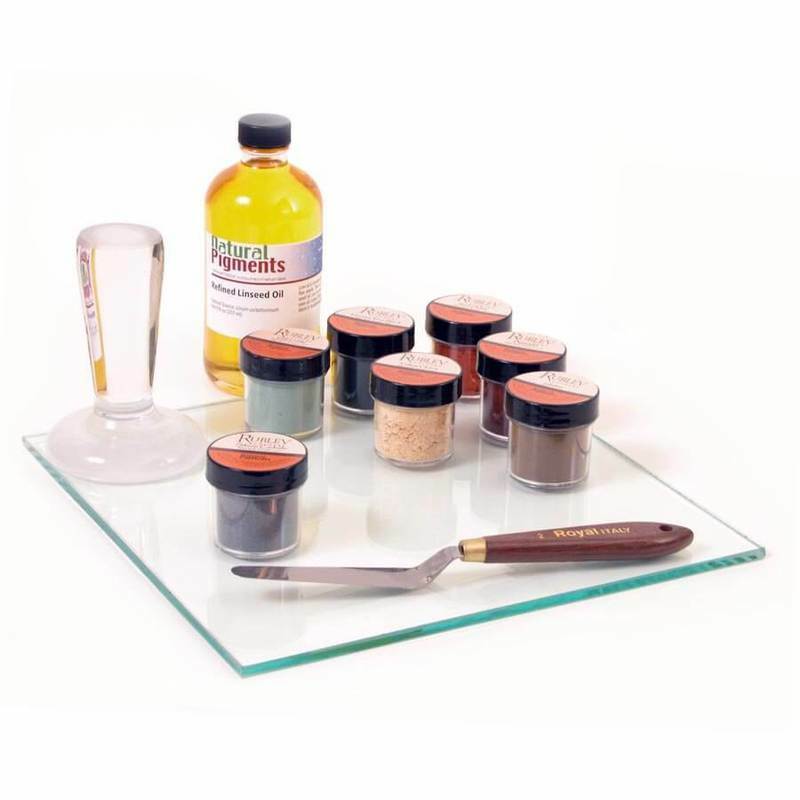 The Natural Pigments Oil Paint-Making Kit is intended for artists who want to expand their oil-painting horizons, but have little or no experience making their own paints. The kit comes wih all the materials that you need to get started, including instructions, basic oil medium, glass muller, grinding surface and six traditional pigments in dry powder form to start making your own oil colors. It is an excellent introduction to paint making, which can open the door to a new range of possibilities in oil mediums, pigments and paint recipes. The kit includes one ounce volume (29 cc) each of Green Earth, Yellow Ocher, Red Ocher, Umber, Titanium White and Black—all packaged in individual plastic jars. The Natural Pigments Oil Paint-Making Kit is designed for artists who wish to make small amounts of oil colors. You will find it useful for making paint on the spot, as you need them. Unlike larger grinding tools, the small size of these tools allows for easy carefree cleanup between use. It's also a great educational tool for instructors to demonstrate how artists' paint was made prior to the 19th century. It is an excellent introduction to paint making, which can open the door to a new range of possibilities in different mediums, pigments and paint recipes. 1 each Making Your Own Water-Solved Paint—This 12-page document contains instructions for preparing the grinding surface, making your own watercolor paint and storing paint in collapsible tubes.